-- The Nimet, a fearsome underground creature with a lot of stamina and tenacity. -- The Venataur, an animal/robot hybrid similar to the Fenris Mechs has been unleashed by the Imperium. - To go along with the new creatures are Kill Point Missions, the NPCs to start them are located near the Cyrene Pet Center at 0x101 Supply Depot. - Many taming spots are located near the Great Plains Teleporter. - The first Cyrene open world platformer, The Sky Labs Platformer, is now available. - This platformer has the same cost as the M.A.R.I.O.V.R. and the L.U.I.G.I.V.S. - Carnap's Landing located near Sky Labs is a new Land Area available for players. - Many mining and creature spawns will be added in the coming Mini Patch. - Improved terrain across the whole of Cyrene. - Cyrene Pet Center has been improved/adjusted and shows the available pets. 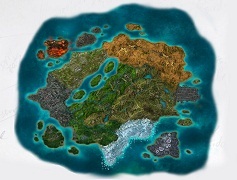 - All Cyrene Teleporter Areas have been changed to have more stable ground. - Many of the NPCs in the A.R.C. Staging Area have been moved indoors. - The cost of Zyn Campfires and Hearty Zyn Campfires have been corrected. - Many global HoF thresholds have been adjusted for low level creatures. - All Cyrene Textures should now appear correctly. - Many grammatical and typographical errors have been corrected (in part to a very vocal and extremely helpful player). - The rewards from Gear Up: New Fap have been adjusted and should now work correctly. -- The A.R.C. Faction Area has been improved and moved into a new wing of the Hub to prevent any sort of out world teleporting. -- All token spawns have been adjusted to help prevent tokens from getting stuck in places players can't reach. -- Token spawns areas have been doubled to 6 areas but each area spawns at approximately 50% reduced rate. -- The Beast in the Pit has reduced stats. -- The Pit is now a PvP Area. - The new pet inventory icons do not function correctly, this will be resolved in the Mini Patch.